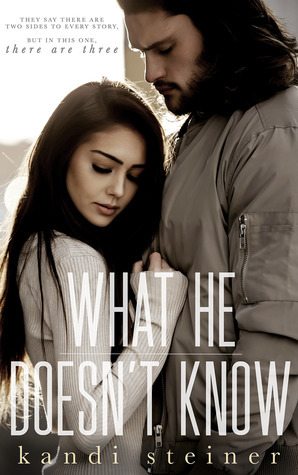 WHAT HE DOESN’T KNOW: Is a full length romance novel and is the first book in the (What he doesn’t know) duet by Author Kandi Steiner. Spoken in ‘Dual Perspectives’ up until the end then we get another persons perspective. The cover alone calls to you, I knew just looking at it that I’d be thrown into a world of feels, a world of angst, a world of tears, a world of devastation. 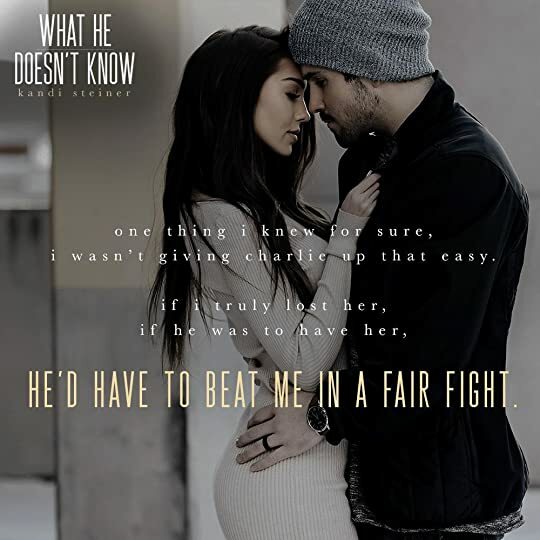 Northeast of Mount Lebanon was where Charlie should’ve been her happiest, it had all her treasured belongings, from her books to her budgies, to her garden and the china her mother passed onto her and the man within it should’ve been where her heart wanted to be but he was the man she didn’t want. Locked in a loveless marriage, a man who puts work before all else, he barely has time for his wife, they are going down a slippery slope of no return, a fast track to a divorce. Both are unhappy but neither know how to fix it. Now that the school holidays are recommencing a new teacher has been hired, thirty five year old Reese, the boy that lived next door to Charlie fourteen years ago has moved back to town. The first boy she gave her heart to. She was his sisters best friend and he was her brothers best friend they were all inseparable until his family moved away. Now he’s back and he wants to claim Charlie marriage be damned. That alone should have sobered me. That alone should have been at the forefront of my mind, but it wasn't. Charlie Reid was married, she was Charlie Pierce now, and still it didn't matter. These two men are complete opposites, one is the sun the other is the moon, one is like an open book the other is closed, one is the life of the party the other isn't, one wears his heart on his sleeve the others heart is dormant, locked away. The cover alone made me believe that the author would set me on a heartfelt emotional journey and that's exactly what she delivered. This pulled on all my emotions, as soon as I picked this up and started reading I was grabbed by the heart, that feeling of devastation as I was nearing the end was intensified when a question was asked 'One month' my heart was torn in half, thinking one path had reached a dead end and she'd then set off on a new and exciting path only to be brought to a standstill, decision time, which path will be chosen has me anticipating the next book like no other. Putting it mildly this book gutted me, brought me to my knees, all the feels had me crying at 7am, at 11.30am I closed that last page with a heavy heart and more tears. These are the kinds of books I run towards, books that make me feel, books that pull every kind of emotion out of me that are kept at bay unless an author can awaken it with her words, can make me feel things that on a daily basis I don't necessarily would feel. And this book right here did that and more.